Self-described as providing "short-term programs for short-term visitors," Ascent of Safed was founded in 1983. 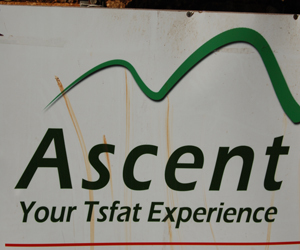 Ascent includes a variety of activities depending on the time of year. For instance, at Chanuka time, visitors to Ascent may find themselves creating the special Chanuka candelabra known as the menorah. Close to the Passover holiday, Ascent may teach guests the art of baking matzoh by hand. If you come for Shabbat, you may find yourself at the table of an authentic Chassidic family. Ascent's mission is to give short-term guests to the area a taste of Judaism with an emphasis on the mystical. Safed has been home to many great kabbalists and so the culture of the city is steeped in this ancient Jewish mystical discipline. Ascent offers a great variety of experiences in an effort to get this mystical flavor across within a short time span. Ascent began with the idea of reaching out to English speakers visiting Safed from abroad. The center now offers a full range of activities for Russian and Hebrew speakers. Seminars have also been conducted in other languages by special request. In 1990, Ascent found its current home in a former hotel building in the old city of Safed. The building has 31 rooms with 75 beds, 2 verandas, a courtyard, 2 lounges, a lecture hall, a synagogue, a dining room where free hot drinks and the use of a refrigerator is provided to guests, and an " extensive Jewish multi-media center." During the year, meals are served only on Shabbat, during monthly seminars, or by special request, but in the summer months, guests are served breakfast. In the summer months, Ascent offers walking tours in Safed and hikes in the Galilee. Guests can sign up to tour the Golan Heights by van. Ascent can arrange for its guests to be hosted by local English-speaking families. The Shabbat third meal is enjoyed group style at Ascent with all staff and guests participating. Guests are requested to dress in modest clothing for prayer and for meals with local families. Ascent guests can stay 4-6 people to a room for a fee of 60 shekels. Rebates of 20 shekels a day are given for participation in weekday classes with another rebate of 5 shekels for filling out an "evaluation form." Private rooms for one or two people cost twice as much, and beds can be added for a fee of 60 shekels per adult, and 30 shekels per child. For a Shabbat stay, the price goes even higher, since this is a popular activity at Ascent. The center offers daily classes with a heavy emphasis on the mystical side of Torah. Classes are offered from 9:00 A.M. until 2:00 P.M. and then again at nighttime. The nighttime classes concentrate on the classical Kabbalah works, such as the Zohar, and Tanya. Those interested in attending seminars or a Shabbat with Ascent should contact the center a month in advance, since the programs fill up fast. Shabbat in Safed with Ascent is, true to the name of the center, an uplifting program, which begins with a dip (for men only) in the icy waters of the famed Ari Mikveh.